Many movies aspire to be live-action cartoons, but few succeed as well as Joe Carnahan’s big screen version of The A-Team. The action sequences are informed by lunacy. Instead of ink and paint and word balloons, the raw materials are CGI, stunt doubles and constant wisecracks. It’s a diverting mixture, and proves to be satisfying entertainment for genre fans who prize explosive weapons above all else. When you see a crack team of ex-Army Rangers parachuting out of an exploding cargo plane while strapped inside a huge tank and under attack from drone planes, you may think you’ve seen it all. But that’s only the first act. Positioned as an origin story, The A-Team begins sometime in the past. The TV show started with the team as civilians hiding in plain sight, but the movie explores their military past as a unit of rule-breaking Army Rangers. Colonel Hannibal Smith (Liam Neeson) commands the unit, creating elaborate plans for his team to follow. The team appears to be a two-man unit at first, with cocksure Face (Bradley Cooper) allowing his romantic side to distract him, requiring Hannibal to come to the rescue. Hannibal makes an impromptu recruitment of B.A. 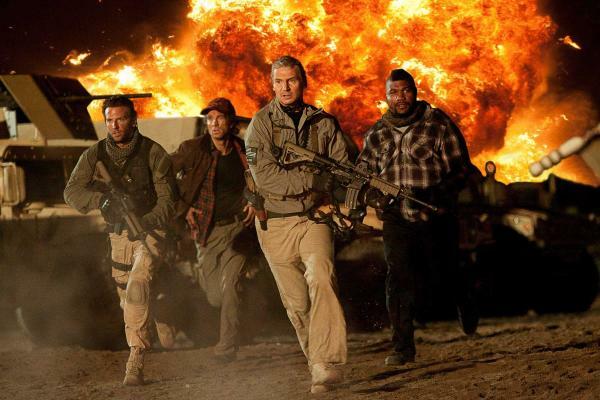 Baracus (Quinton ‘Rampage’ Jackson) and together the men free the possibly insane Murdock (Sharlto Copley from District 9) from a psychiatric hospital. Eight years and “many missions later,” the boys are in Baghdad as the U.S. prepares to pull out of Iraq. (So is it meant to be set in the near future?) A shadowy CIA figure calling himself Lynch (Patrick Wilson) tries to convince Hannibal to take on one last mission in country: Recover stolen plates used to print U.S. currency from the Iraqis who stole them and are printing $100 bills like they’re going out of style. Hannibal’s superior, General Morrison (Gerald McRaney, veteran of 80s detective show Simon & Simon) officially implores Hannibal to leave the job alone, but Hannibal can’t resist, and concocts a crazed plan to retake the plates. Things go almost entirely as planned, and it’s the unexpected turn of events that lands the boys in separate maximum security prisons, stripped of their ranks and dishonorably discharged from the military. From there it’s one exhausting adventure after another, as the team seeks to clear their name and recover the stolen currency plates. As long as you can accept the film’s basic premise that all action takes place in a parallel universe without regard to gravity, logic, or reason, The A-Team is a pumped-up joyride. Imagine that you and your buddies manage to steal the President’s limousine, smash up Washington D.C. at high speeds, blow up a few landmarks, and emerge unscathed. Coming from Joe Carnahan, whose reputation rests squarely upon the mindless excesses of Narc (his serious side) and Smokin’ Aces (his thriller side), the film’s approach is not surprising. Working from a script credited to himself, actor Brian Bloom (who plays black ops leader and all-around villain Pike with relish), and Skip Woods (Thursday, Swordfish, Hitman, X-Men Origins: Wolverine), Carnahan competently handles the pesky plot details, which are mostly left to Army Captain / Lieutenant Charisa Sosa (Jessica Biel, distractingly gorgeous as always) to explain. Clearly, though, the action scenes are the movie’s reason for existence, and Carnahan’s taste, crass as it has sometimes been in the past, is here reined in sufficiently so as to almost approach modesty (at least by his previously-established standards). Imagine that! Not only does this approach garner the necessary PG-13 rating, but it also serves the material well. The old TV show was always a creaky machine for adults, endlessly riffing on the most basic traits of the four main characters. They never rose above their stereotypes and their bantering interplay always gave way to saving an innocent and remaining outlaws. The movie does much the same thing, only with a gigantic budget. Gregarious in spirit, its aftertaste is guaranteed to melt as quickly as ice on a mid-day sidewalk. But while it’s on the tongue, it’s oh so refreshing.